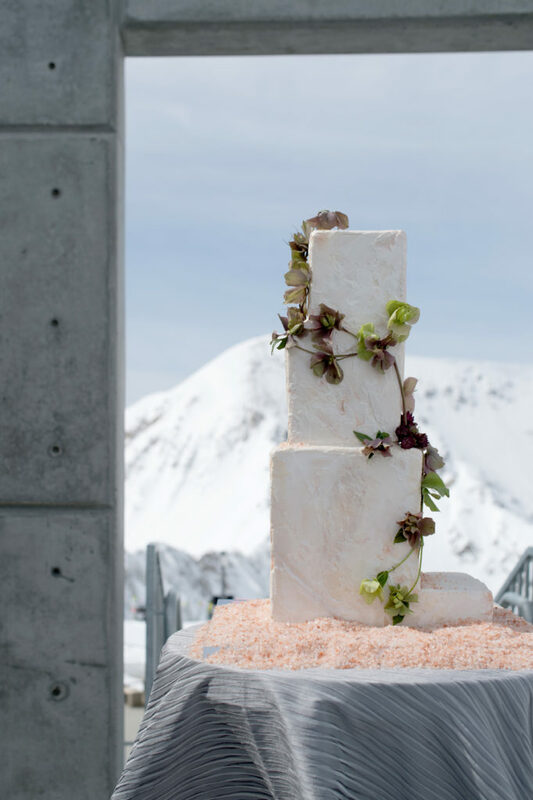 What would it look like to capture the drama of a snow-covered mountain vista against the romantic textures of a wedding? 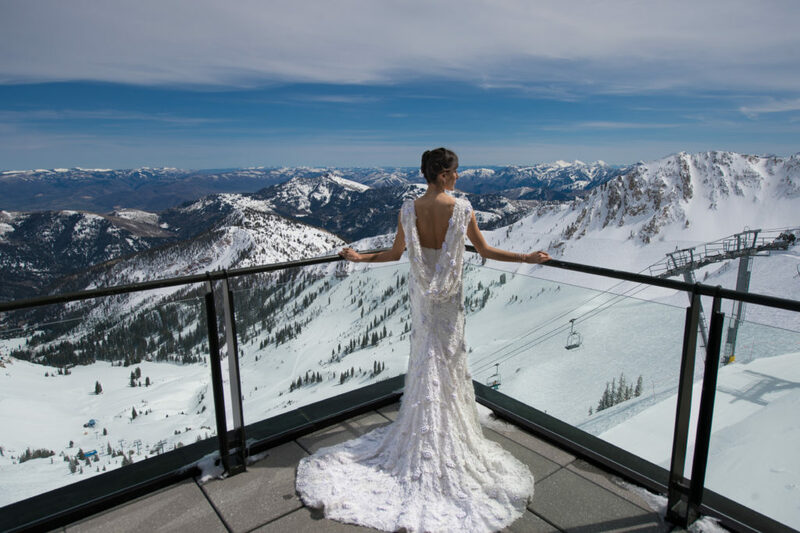 With the latest Vivince styled shoot, we sought to explore that very question; leveraging the aggressive backdrop of Snowbird’s twin peaks and the soft clean blanket of white snow that covered them. A winter white inspiration was the obvious and easy choice, but in a space this vast we quickly realized that we needed to incorporate an equally dramatic and artful twist to the production. The result? The collaborative Snowbird Styled Shoot. 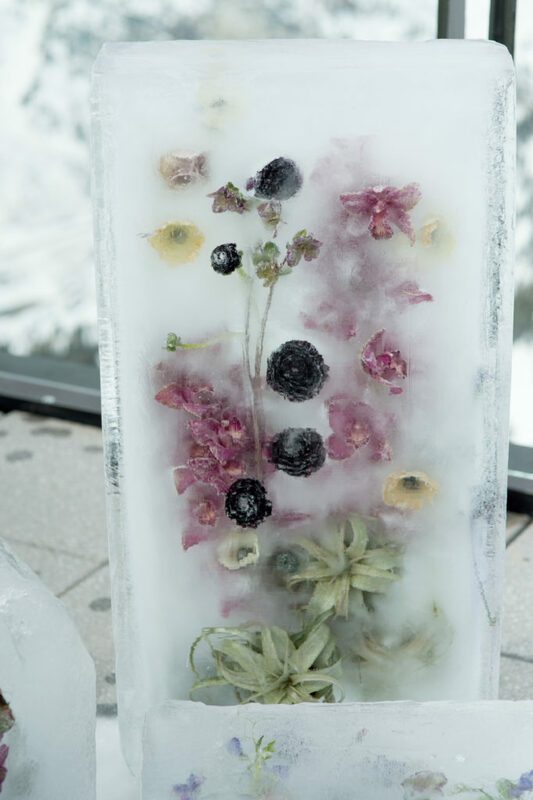 Influenced by the work of Kenji Shibata who is known for his frozen floral art pieces, we set out to embody a look of colorful delicacy wrapped in an icy atmosphere. Snowbird’s resort was the perfect canvas, hidden away in the Wasatch National Forest outside Salt Lake City. Surrounded by rugged mountains and dressed in snow, the ski resort lent itself to the crisp canvas and unkempt beauty we set out to capture. 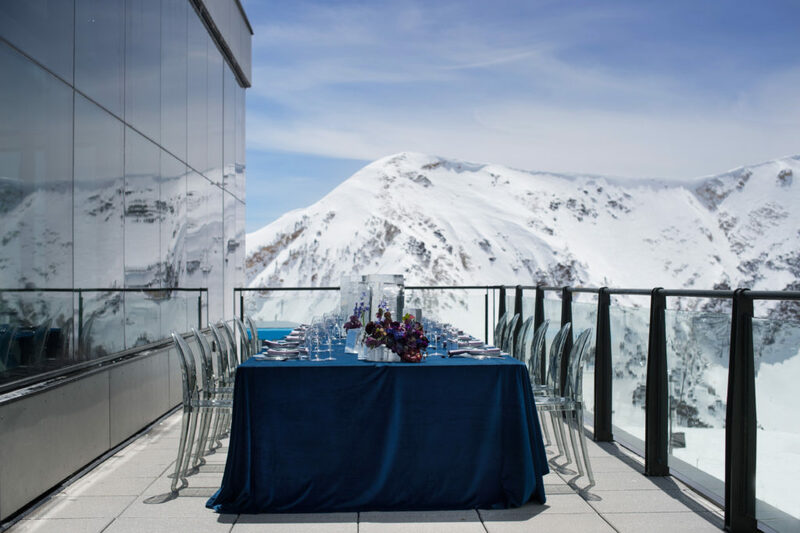 With a stark contrast, the contemporary lines of Cliff Lodge and the summit restaurant provided sense of place and added a minimalist modern muse to guide the aesthetic. Our backdrop was chosen, and from here our artistry began to take shape. 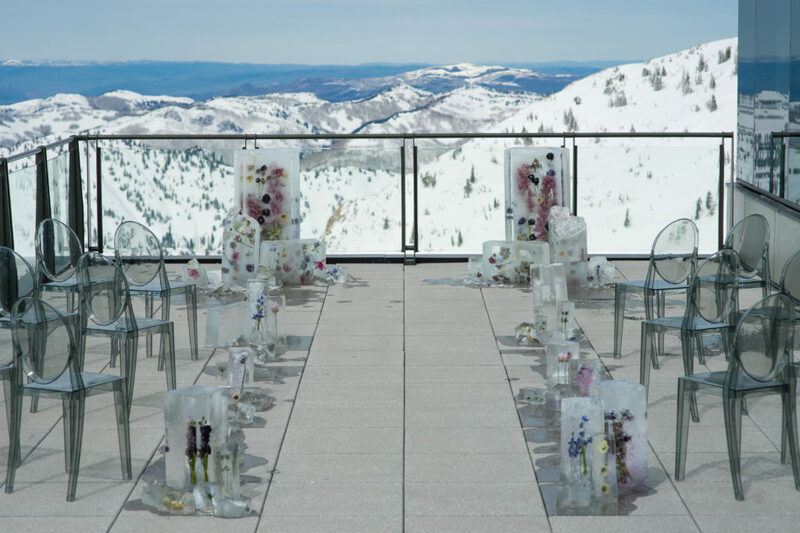 The ceremony was held at the all-glass West Terrace, where white and purple flowers by Artisan Bloom lined the aisle; suspended in frozen geometric sculptures of ice. After the ceremony, a cocktail hour and reception warmed us up in a cool way, as drinks were served from a bar made of frozen florals to create a romantic texture that could feel at home in the surrounding mountainous atmosphere. Minty muse met deep blue details and marble dinnerware, as the table setting played into the wintry theme and added a strength of color that grounded the image. 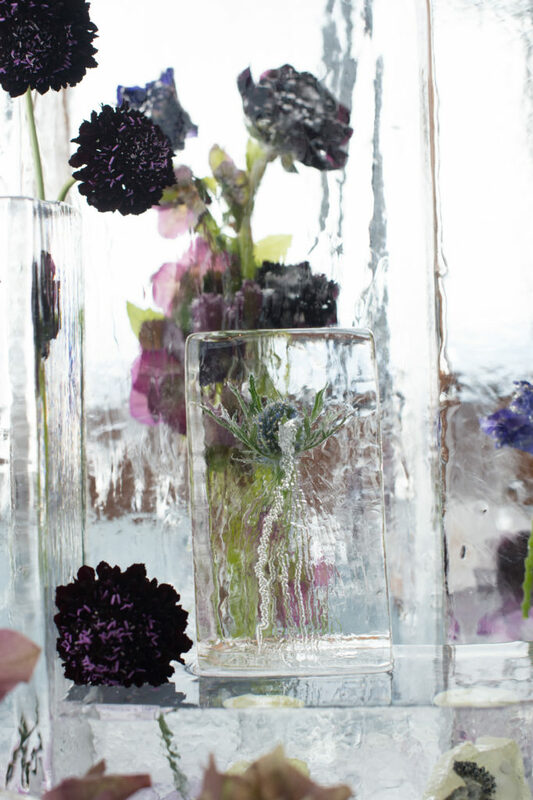 With frozen blue and purple blooms encapsulated in ice as the centerpiece, the winter watercolor tableware complimented the sophisticated floral ice with touches of romance. Feeling the dramatic white winter artistry yet? 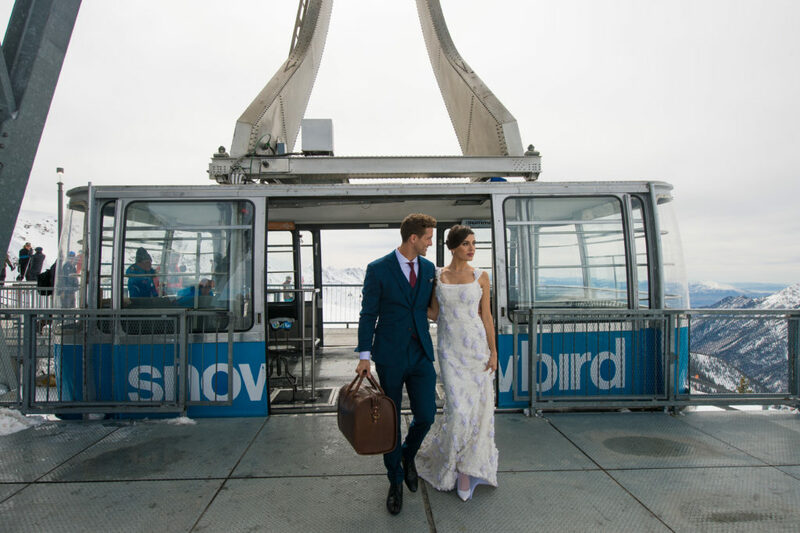 Be on the lookout for the full Snowbird Styled Shoot coming soon!